Does it make an efficiency difference, if you spend candies and dust to boost CP before evolving, to gain more from the amplification? Or is it more efficient to just evolve without spending, and then using the leftover candies afterwards, since they now give a bigger CP boost per candy? I only tested with a Rattata so far, which gained +8 CP per candy before evolving, and +15 CP afterwards. I collected no numbers on the amplification efficiency though, and now ran out of materials for further testing. Or maybe it is a balanced calculation and makes no difference at all? I would love to have some insight on that. Weedle (GPC 6) evolved at 79 CP to a 84 CP Kakuna (GPC 6), evolved at 90 CP to a 297 CP Beedrill Note: The max-CP "half circle" in the profile stayed filled roughly at the same relative position throughout the evolutions. When you evolve a Pokemon, its CP circle stays as full as it did before. Powerups cost more Candies the more CP a Pokemon has (based on a Pokemon's level). Powerups cost more Stardust the more CP a Pokemon has (again, based on level). Cost will increase every second powerup. Therefore, it makes sense to power up a Pokemon until it is near the upper end of your CP ring. As the ring stays in the same place, it will give you a rather decent CP per Candy ratio. For example, if a Pokemon's max CP was 515 and it is currently at 425, it would make sense to power it up to 500 or more. At that point, you should evolve it, provided you have the candies. Overall, you'll still be using fewer candies because you're doing most of your evolution on the lower side of the scale, and using the Evolution mechanic to sharply spike the Pokemon's CP. The cost increases as the Pokemon's CP increases. Each Pokemon species has separate thresholds for the increases in power up costs. Evolutions have proportional thresholds for power up cost increases. For example, a Rattata and a Jigglypuff at the same CP will have different power up costs. However, a Rattata and a Raticate with proportional CPs (Same place on the semicircle and same percentage of maximum CP) will have the same power up costs. 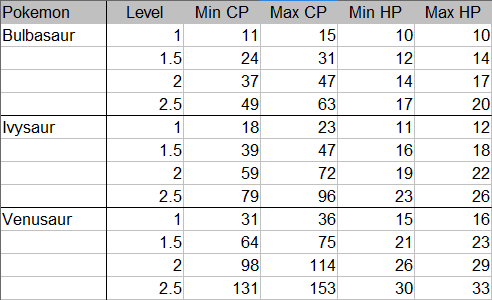 Since CP increases from power ups are also proportional across evolutions, you'll get the same results for the same amount of stardust and candies whether you power up the Pokemon before or after evolving it. Each Pokemon you obtain will have two sets of values and a level, which are all used to determine the CP value. All Pokemon of the same species will share the same base stats, while each individual Pokemon will also have a unique set of individual values (IVs). If you look at Pokemon at the same level, you'll find that the possible CP values are dependant on the IVs of each Pokemon. That is, at each level, there's a range of possible CPs for each type of Pokemon. A level 1 Bulbasaur can have a CP value between 11 and 15, depending on the IVs of the Bulbasaur. If you power up a Pokemon, its level will increase by one half level. The now level 1.5 Bulbasaur, will have a CP value between 24 and 31. If you had two identical Bulbasaurs (not likely), you would find that either way you chose to power it up, you'd end up with the exact same Pokemon. Keep in mind that you can only ever power up a Pokemon, to 1.5 levels above your trainer level. So for a level 1 trainer, you can only power up a Pokemon to level 2.5. For the following example, the trainer level is 1, and we have two of the worst level 1 Bulbasaurs ever (0% IV). So in both scenarios, the Bulbasaur starts out at CP 11. In the first example, we'll power him up to level 2.5 (the max we can). At this point, we'll have a Bulbasaur with a CP of 49. Once the Bulbasaur is at max level, we'll evolve it all the way up. After the first evolution, we'll have a 79 CP Ivysaur. Evolving again leaves us with a 131 CP Venusaur. Starting with the second Bulbasaur, We'll evolve it into a 18 CP Ivysaur, and further evolve it into a 31 CP Venusaur. After powering up the Venusaur to level 2.5, we'll be left once again with a 131 CP Venusaur. As you can see, in both scenarios we ended up with the same exact Pokemon. Keep in mind, however, that as your trainer level increase, you'll catch more powerful Pokemon. So if you evolve a Pokemon when you're at lower trainer levels, you could find that you're catching more powerful wild Pokemon later. All that being said, there's at least one advantage to evolving first. And that's knowing the evolved Pokemon's move set, prior to spending large amounts of stardust to power it up. If you evolve a Pokemon and the final evolution has a bad move set, you might not want to spend stardust powering it up. If instead you powered it up before evolving, you'll be stuck with a high CP Pokemon with cruddy moves. I'm level 15, and what I have found is that the higher your level is, the higher max CP your Pokemon will have. If you want the highest court, then save your dust for later levels. I maxed out a raticate at around level 7 and it had 387 cp. Later, I evolved a new Ratata and the Raticate was at 562 with no leveling. I collected some data. I started with two CP 10 Weedle. I evolved one and then powered it up, and I powered up the other and then evolved it. 1) Evolution then powerup yielded 11 CP. Powerup then evolution yielded 10 CP. 2) From experience powering up another Pokemon earlier today, the powerup seems to give a slightly randomized amount (unless the server lagged and somehow calculated multiple powerups at once for part of it). If there is in fact a range rather than a fixed increase, then this question becomes much harder to definitively answer. However, I speculate that the order does not really matter. Every time you power up your pokemon, the cost of powering up will increase. Since powering up will cost one or more candies, the more cost-efficient strategy is to evolve the pokemon and then powerup it. My strategy here is to catch the highest CP pokemon from the same species, then look at his attack and decide if it coulds fit my needed: more powerful attacks or a type-based attack? Then evolve, then power up. You should wait to feed your pokemon until after you have evolved it. The reason is simple: At any time you may come across a pokemon of the same species with a higher CP. Now you want to evolve that one instead, and the candy-investment you did on the first pokemon was in vain. Pokemon Go: Power up a low CP Venusaur or wait to evolve a high CP Bulbasaur? One eevee from 255 cp to 700 cp and one eevee from 200 cp to 400 cp . How? Eevee CP 282 Evolve or potentiate? Should I continue to Power Up my Pokemon, or evolve it ASAP? Will the attack strength of my evee carry over to its evolved form? When, what, and which to Evolve? Wait for level up or evolve my Pokemon? In Pokemon Go, would it cost the same stardust and candies to Power Up if the Pokemon is evolved first or afterwards? Most efficient way to evolve? How does a Pokémon gain CP when evolving? Limit on how many candies you will receive? How does evolving relate to CP? Does CP affect size when evolving? How did I end-up having a 78-cp Weedle and a 62-cp Kakuna (an evolved Weedle)? Does evolving a Pokemon change the moves it has? Does evolving your buddy retain the amount of walking you have done thus far? Can you get candies while feeding pokemon remotely?